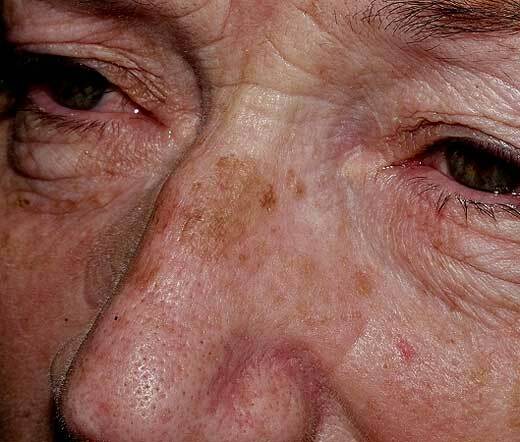 Age spots also referred to as liver spots or senile lentigos are over pigmented areas of the skin. Age spots are the flat brown, black or yellow spots that appear on the neck, hands, face and other parts of the body. They are primarily caused by UV damage. They start appearing as brown spots from the age of 40 onward as the skin becomes damaged by prolonged sun exposure, and brown spots are very common in this age group, particularly in those who spend prolonged period in the sun. Age spots are not dangerous in any way, so there is no medical reason to get rid of them. However, they can reveal a person’s age, so many men and women want to remove them for aesthetic reasons. 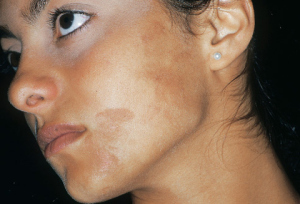 Brown spots are very superficial and the pigments that form them reside only on the epidermis (on top of the skin). 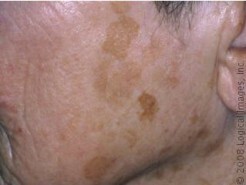 If left untreated brown spots will progress into becoming intra-dermal and this is when they are referred as age spots. This is because if left untreated the melanocites continue their over production of melanin which will gradually saturates the epidermis and the pigments will move into the upper dermis first and over time the pigments can also move into the hypodermis. The are referred to as liver spots because they were once incorrectly believed to be caused by liver problems, but they are physiologically unrelated to the liver. Example of brown spots caused by recent sun damage. It is not easy to the untrained eye to make a clear distinction between brown spots and age spots. Beauty professionals who have been dealing with the removal of these types of hyperpigmentation can usually distinguish them very easily, however the difference is very subtle. As a rule of thumb whenever there is a hyper-pigmented area on an individual under the age of 50 you are probably dealing with a brown spot which is very easily removed. 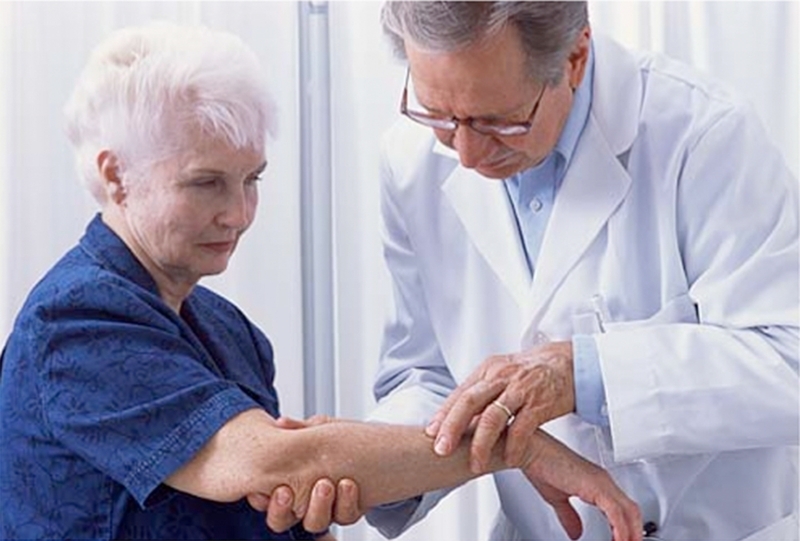 However when the similar dark spot is shown on someone over the age of 60 you are probably dealing with an age spot or age spots. Once diagnosed as age spots, you can rest assured that the only reason for you to remove them is merely aesthetic. There is no reason to worry. However given that the main cause of age spot is not only aging but also sun damage over a long period of time, it has been shown that those who have many age spots have more chances to develop some form of cutaneous malignant growths. Once you know you have age spots it is a good idea to visit your Dermatologist periodically. Early detection of malignant growths often resolve them very easily without major complications. This higher chances of developing skin cancer is not caused by the age spots per se, however they are caused by the same underlining prolonged UV damage which caused the age spots in the first place. Therefore if you have age spots it is good practice to visit your dermatologist frequently for a check up of your skin. Mole mapping in your case would be good practice. The primary cause of age spots is not only ageing but mainly prolonged sun exposure and/or use of sun beds. The primary cause of Age spots is prolonged UV damage to your skin. UV light breaks down the DNA in your skin. Sometimes this damage is not evident and it can show up many years after the original damage has been done. If you purposely exposed yourself to the sun in your youth, your likelihood to develop age-spots later in life is grammatically increased. People of skin type from 1 to 3 are more prone to developing age spots. 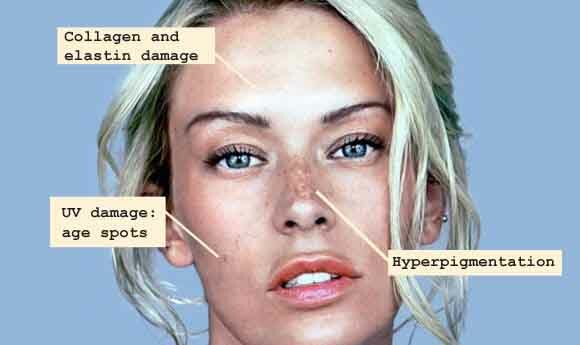 Initially they appear in the early 40s as brown spots especially after intense exposure to UV rays or use of sunbeds. As time passes the pigments of the brown spots over saturates the epidermis and move deeper and deeper into the skin, this is is when they become age spots. Age spots are normally on those people who are over the age of 60 and had a prolonged UV damage. Prevention is done from early age. If you are skin type 1 to 3 avoiding excessive tanning and excessive sun exposure is a must. If sun exposure cannot be avoided it is advisable to wear Broad Spectrum total sunscreen. 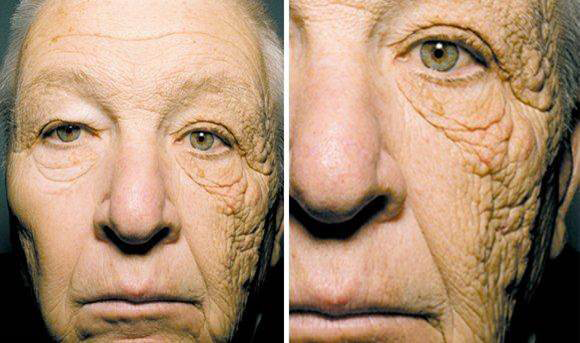 This woman had prolonged sun exposure only on one side of her face. She was sitting for years in her office exposing her left side of the face to the sun. The damage to the skin caused by the UV radiation is very evident only on the area exposed to UV light over time. Prolonged and unprotected sun exposure should be avoided from early age. Remember that the damage of excessive UV light from the sun or sun beds do not limit to the formation of Brown spots and later age spots, also excessive exposure lead to skin ageing and wrinkling. Sometimes UV damage can cause more serious health issues including malignant growths. If you have already developed brown spots or age spots it is very important that you wear total sunscreen everyday and try to avoid sun exposure during peak time especially between 10am till 3pm in the summer. Fortunately, if you have age spots you do not have to live with them because there are several effective ways to remove them. Those ways range from professional aesthetic treatments, to home cosmetic peels which will fade your age spots over time. The basic principle all the effective treatments are based on is “skin resurfacing” and this applies to both the home based solutions and the professional type of treatments. There are also some “natural” remedies, which, although we have not verified their effectiveness, you can review them by clicking here and HERE. Removing age spots is not difficult! Remember to use Broad Spectrum Sun Screen during the treatment for Age spot removal. Especially while using exfoliants (while you still experience the skin exfoliation) or soon after professional aesthetic treatments you may be required to avoid sun exposure altogether. This option is not what we would advise to remove age spots, however this is mostly prescribed by some doctors in the US. Hydroquinone is a very effective skin bleaching substance which can significantly reduce the appearance of age spots over time. In the US hydroquinone is available in concentrations up to 2% over-the-counter, but higher concentrations will require a prescription from your doctor. Be aware that hydroquinone has been banned in Europe and some Asian countries, due to its alleged potential carcinogenic properties. However, it is still widely available in the US. Hydroquinone has been banned in all cosmetic products in Europe due to its alleged potential carcinogens properties. At Areton LTD we advise against the use of Hydroquinone based products, this is not only because they are banned from cosmetic products in Europe but mainly because there are much simpler and low-risk ways to remove age spots effectively. Why taking any risks if simple innocuous products can resolve your age spots? Tretinoin is currently classed as a prescription drug available in Europe. Tretinoin is used to improve the appearance of fine wrinkles by inducing skin regeneration, it also makes rough facial skin feel smoother. Tretinoin is allowed in products within the European union, however it is classed as a medication and can only be prescribed by your doctor. The immediate after effects of tretinoin based topical products is a mild flaky peeling. Please, bear in mind that age spots are dermal therefore tretinoin based products like any other cosmetic exfoliants need to be used a number of times over a number of weeks or months in order to achieve the desired effects. Please note that immediate results are not achievable by either usin Tratinoin or other Retin-A products. Use products containing glycolic acid or AHA’s in general. Glycolic acid is type of alpha hydroxy acid which is commonly used in chemical peels. It works by exfoliating the skin, diminishing the appearance of fine lines, wrinkles and age spots. Glycolic acid is found in cream or lotion form, which is usually applied and left to sit on the skin for a few minutes, before being rinsed off. AHAs are very effective in removing Age Spots. Glycolic acid can be quite harsh on the skin, sometimes causing redness and discomfort. It is highly recommended you patch test any product containing AHA’s before full application. This is because the skin reaction to AHAs vary from person to person. The advantage of AHAs is that they are just as effective as Retin-A and sometimes even more effective than Hydroquinene in removing age spots and they are widely available on the market in Europe and outside Europe. Additionally the use and concentration of most AHAs are not regulated in Europe making AHAs based products widely available and often relatively inexpensive. Although a type of AHA , TCA is particularly aggressive and difficult to control and there had been report of the formation of hyper pigmented areas after its use, causality has not yet been clearly demonstrated, hoverer given that other AHA’a are easily available in the market and very effective in removing age spots, it is recommended to use mild peels like Glycolic, Mandelic, pyruvic, lactic acid etc. Professional treatments include the use of aesthetic lasers, electrical arcing, special marks and peels. Please note that the results will be the eventual removal of your age spots, however even professional treatment cannot guarantee removal in one session and often multiple professional treatments may be necessary to remove your Age Spots. As we will also see, the cost of these professional treatments although as effective as the ones we discussed previously as by far more expensive. During the treatment with lasers , an intense laser light penetrates the epidermis and causes pigmented area to be shattered. The intensity of the light scatters the skin pigments and destroys the discolouration. An anaesthetic cream is applied 30 to 45 minutes before the procedure to ease the discomfort. The laser treatment is not very painful after the use of numbing products, but may cause some discomfort. The number of sessions required will depend on the depth of the age spots as well as the size of the area and number of spots to be treated. Generally, 2 to 3 sessions will be required. Each session can last from 30 to 45 minutes. The treatment requires has minimal downtime, but redness, puffiness and sensitivity to sunlight may occur. Although laser treatment is extremely effective, its major downside is the cost. Depending on the type of laser used (Q-switched ruby, alexandrite or Fraxel dual laser) and the number of age spots requiring treatment, prices can range from $300 to $600 per session. Microdermabrasion is a non-invasive skin treatment that uses a wand with air pressure. The wand blasts crystals, zinc or other abrasive materials directly against the skin, exfoliating the top layers to remove the dark, hyperpigmented skin. Microdermabrasion is effective in removing Age Spots. Microdermabrasion has little down time and there are few side effects, including redness. As usual you should not expect immediate removal of your age spots as they are often rooted deep inside the skin. Typically, 2 to 3 sessions will be required to achieve the desired results. Prices range can be $75 or more per session. Skin resurfacing can be done in several ways. One of them is the use of electrical arcing (also referred to as plasma or electrofulguration). The treatment is very simple and it involves the use of the electrical arc to superficially ablate the or destroy the over pigmented are of the age spots. It is possible to remove any brown spots within one session only, however this is not advisable as this increases the risks of scarring. Therefore a number of sessions may be required in order to achieve the desired results. The treatment is usually repeated at 4 to 5 weeks interval. The treated area may scab off, depending on how tghe treatment has been carried out. 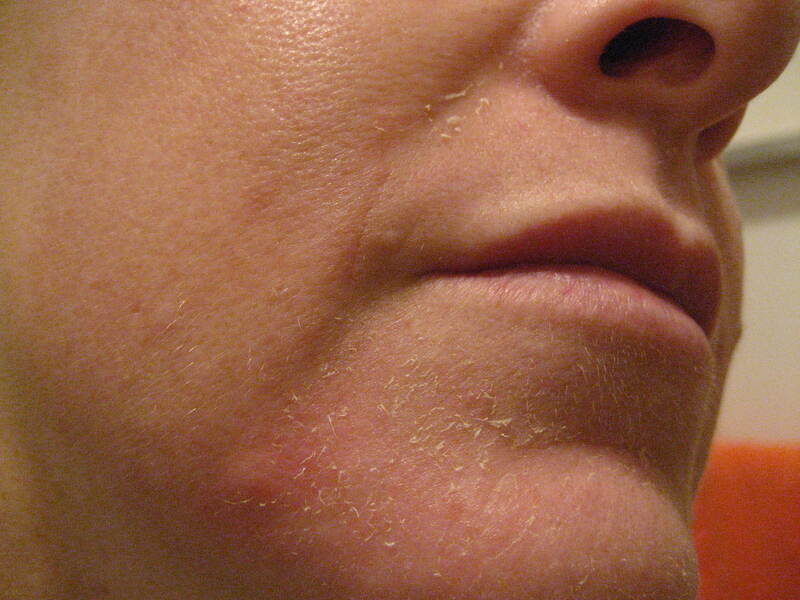 Chemical peel is another skin resurfacing technique. A chemical peel works by dissolving dead skin so new radiant skin will surface. During a chemical peel, the area to be treated is thoroughly cleansed and a gel-like acidic substance is applied on your skin. If you are having a professional peel done, sometimes (depending on the type of peel used), the area is then neutralized to stop the chemical process. Chemical peels are both a professional and a home based option to remove your brown spots. Generally, a number of peeling treatment sessions are required, which are carried out in 3- to 4-week intervals. The prices per session can be $250. Sun screen is a must! Sunscreen won’t actually help to reduce the appearance of your existing age spots, but it will prevent new ones from forming (as they are caused primarily by sun damage). You should wear a sunscreen with a zinc oxide base and an SPF of at least 15 everyday, even if it’s not hot or sunny. Avoid using sun beds and direct sun exposure between 10 am and 3 pm in the summer even if you are wearing total broad spectrum sunscreen. This is the only knwon way to prevent further ages spots or brown spots to develop.